Many of you have undoubtedly met this interesting cactus before. Some of you probably own one. Commonly referred to as 'Hibotan' or "moon cactus," these are not a single species cactus but rather two different cacti that have been grafted together. The colorful top part is known scientifically as Gymnocalycium mihanovichii. It is endemic to Paraguay and some provinces of Argentina. In the wild it is not nearly this colorful. The specimens sold in garden shops all over the world are actually mutant varieties that do not produce chlorophyll, thus revealing other pigments that are normally masked by green. The color of these mutants can range from yellows to reds and even deep purples. Without chlorophyll, these mutants would normally die as seedlings. The wild version of Gymnocalycium mihanovichii is a lot less coloreful. Provided their host cactus is kept happy, mutant Gymnocalycium mihanovichii will flower. 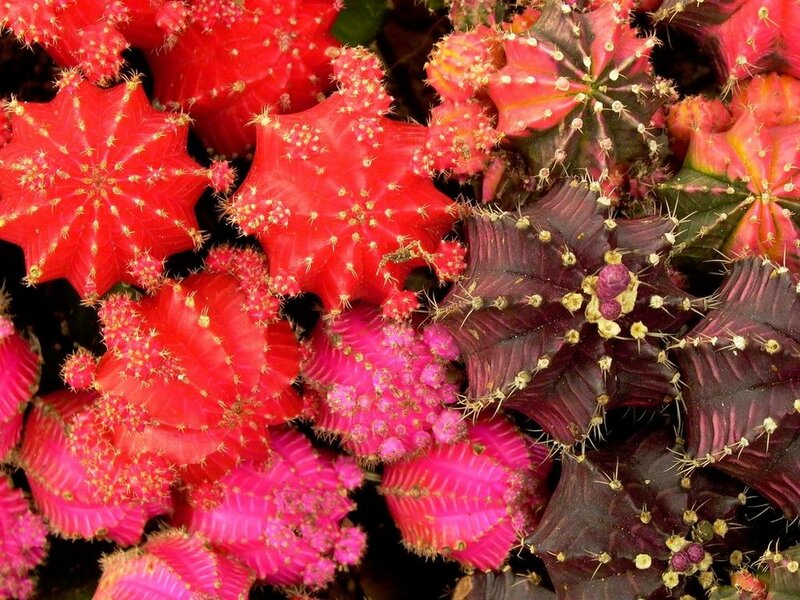 At some point in time, someone got it in their head that they could graft these colorful mutants onto other species of cacti and perhaps they would survive. This is exactly what has happened. Interestingly enough, the bottom host cactus isn't even in the same genus as the moon cactus. Grafting is most often done on a species of Hylocereus (the same genus responsible for dragon fruit). How and why this host was chosen I do not know. Either way, armed with this knowledge, I hope you have gained a new found appreciation for these seemingly ubiquitous house plants.